Florian Wagner, an adventure photographer from a small town in the Bavarian Alps, and his team, have been making headlines all over Ireland during the past two months. Their epic journey would take them from Mizen Head, Cork, all the way to Malin Head, in the Inishowen Peninsula, Co. Donegal. Florian said that "After having completed a similar trek in Germany one of my sponsors suggested Ireland as our next destination, since I had always wanted to explore Ireland, I jumped at the opportunity"
This was no ordinary road trip, the team would complete over 800 miles on horseback, capturing the diverse and beautiful Irish landscape along the way. 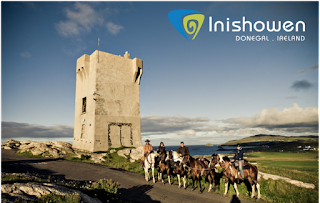 You can see the team above, at the iconic, Wild Atlantic Way signature point; "Banbas Crown", a Napoleonic Tower, which marked the end of their long journey. 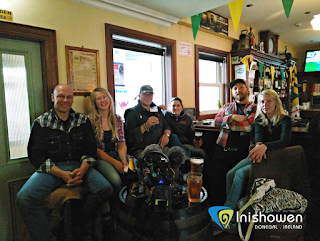 Florian noted that "Irish people have really proven their hospitality big time from the very start, the first friendly person we met was a truck driver on the ferry over". 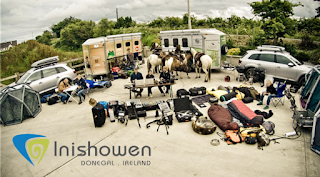 Through word of mouth and an eagerness, as found by Florian "within the Irish horse community, who all seem to know each other" people throughout the country "offered to stable the horses" and put them up for the night. Myself and Sally Toland, from Inishowen Tourism, reached out to the team when we heard of their journey to Malin Head. On arrival at Malin Stables we welcomed the group, pictured above, and were on hand to assist with their itinerary. The teams itinerary in Inishowen, Donegal, included; visiting the Doagh Famine Village located on the Isle of Doagh, traveling on horseback through varied terrain and picturesque beaches at Shroove, Pollan Bay, Trawbreaga Bay and Malin Head itself. The crew enjoyed the hospitality of the Malin Hotel, The Seaview Tavern Bar and Restaurant and as you can see above, the team enjoyed a few drinks and some traditional music in Farrens Bar, Ireland's most northerly bar. The team expressed gratitude to Malin Equestrian Centre, who stabled their horses and who were on hand to guide them along trails. A highlight for Florian and the team during their stay was a trek guided by Kane Gurney from Malin Stables, which took them "along the beautiful east coast of Inishowen from where we could see Scotland". Florian said that "Some of the most epic moments were at the Slieve League Cliffs, Donegal, Achill island off the West Coast of Mayo and Malin Head. "I just thought Malin Head was some place at the end of the world, some magazines say there are hardly any roads and no-one lives there but we found it the total opposite. It is remote in that it's not over populated but there are a lot of people and they're very nice and there are fantastic stable facilities at Malin Stables"
The main challenge for the team was a lack of sleep "We were working very hard before we left Germany so we were tired even before we started. We soon got into the rhythm of fighting through long days". 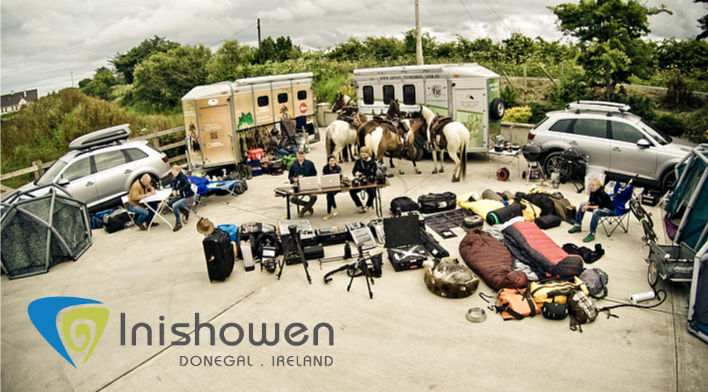 With a jam packed schedule it was hard for Florian and the team to see and do everything that they wanted to in Inishowen. Florian wants to return "to ride along the sea when the tide is out which I haven't done here in Inishowen and so I would have loved to do that and I really want to come back"
Find out more about Florian and the Teams Journey!